When I was much younger, Beauty and the Beast was my favorite Disney movie, and Belle was my favorite princess. Or really “Princess” since she was not one by birth, and really, was the Beast a Prince or just a Lord of a Castle, because where was the kingdom in all of this? Anyway, I guess the reason why I liked her more than lets say, Ariel, was probably because I must have identified with her more (and I was not a mermaid). She liked to read, she was different than the other girls, and in a way, she wasn’t entirely helpless and harping on and on about some man to come around and save them. It was on TV the other night. It was the first time I’ve watched it since I was a kid. I still think Belle was the best of the princesses, but I don’t think she really followed through on why I liked her so much. In the beginning of the movie, she goes on and on about how she wants to get out of this small town rut. Apparently this means move into the Castle next door and live there happily ever after as a princess. Is that what she meant by adventure? Fairy tales seem so innocent and simple when you are young. One day you will meet Prince Charming and ride off into the sunset, happily ever after. But is it that easy? Maybe, now that I am older, I find I identify more with the Beast than with Belle. A Beast, like this guy. I mean, let’s think about this. I’ve built up this little kingdom (a life) filled with people I care about and care about me, regardless of my lack of beauty, and put up with my less than nice persona. Perhaps because I was not the nicest person to some boys, I’ve been cursed and am destined to be alone (karma). My rose signifies that point in which all hope will be lost and my cat lady status will be permanent. Gaston really represents all other women who are beautiful, and have this way about them that make men trip over themselves to be near (except my guy, of course). So, basically my only hope is to lure and falsely imprison some guy into my world, hoping that he sees past my mean and scary facade and falls in love with me, despite mysef. Somehow that doesn’t sound like a good plan (or a legal one, for that matter). Plus, does anyone think about all the servants who were dishware and tucked into the cupboard at the time the spell was broken? Odd how fairy tales seem a little different when you’re older. But, enough of that and onto something sweet! This whole week I’ve been playing the, what can I make with all the random leftovers I’ve been keeping in my fridge that need to be used or will need to be thrown out, game. Today’s challenge: a block of cream cheese I bought a month ago, a carton of heavy cream, and some strawberries taking a turn for the worse. To make this even more interesting, the heat and humidity basically also means I really do not want to turn on the oven. 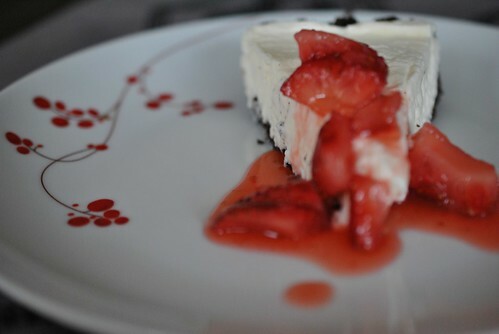 How about the No-Bake Cheesecake from http://www.joyofbaking.com? The recipe is super simple and doesn’t require anything special. 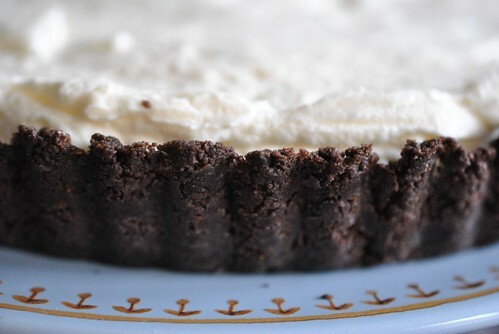 I decided to make a chocolate graham cracker crust just to make it a little more interesting. Plus, as always, cut down on the sugar a bit. 1 Pack (9 sheets) Chocolate Graham Crackers, crushed into crumbs. First, make the crust. 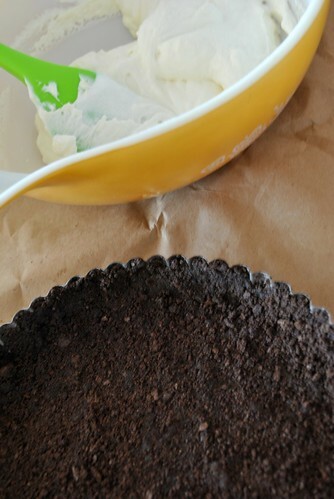 Take a tart shell (or pie pan or springform pan) and give it a nice greasing. Combine the graham cracker crumbs with the melted butter and mix it up. Add more butter if needed. The consistency is right if you squeeze the crumbs together and it clumps. Put the crumbs into the pan and press the crumbs down to form the crust. Cover the crust with plastic wrap and put in the fridge. To make the filling, put the block of cream cheese into the bowl of a stand mixer. With the paddle attachment, beat the cream cheese until light and fluffy. Add the sugar and the vanilla and beat till combined and more fluffy. Transfer to a large bowl and clean the mixing bowl. Unless of course, you are fortunate enough to have two mixer bowls, then just use the second one for the whipped cream. Dry well, and throw the bowl and the whisk attachment into the freezer for a few minutes. After a few minutes in the freezer, pull out the bowl and pour in the heavy cream. 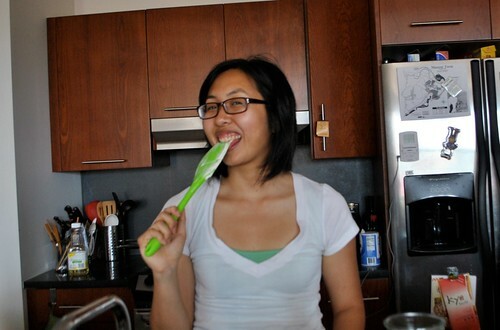 With the whisk attachment, whisk until soft peaks form. Remember to test by dipping the whisk into the cream, flipping upside down and see if the peak stays. Pour mixture into the crust. Smooth out the top. Cover with plastic and put in the fridge to set for many hours, overnight, if you can. 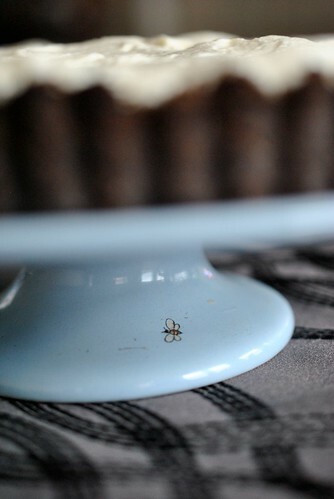 New cake stand. It has a bee! By itself, it’s okay, but kind of plain. So, I made a strawberry mush to go with it. 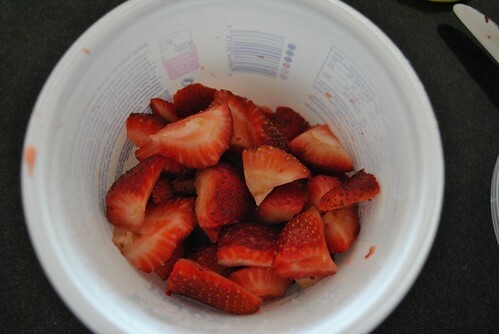 My strawberries were starting to go bad, so I cut up the good ones and tossed them with some sugar and let them sit in the fridge while the cheesecake was setting. 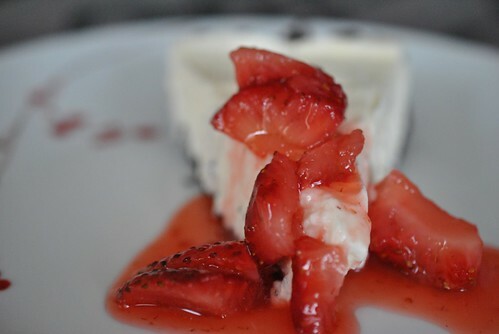 Once the cheesecake had set, cut a slice, and top with some strawberry mush. The cheesecake filling was light. It tasted like a whipped cream with some cream cheese tang to it. The chocolate crust was a nice touch. The strawberries on top pulled it all together. It was such a light summery dessert. It is definitely not like a traditional cheesecake at all, but I’ll take this if it means I don’t have to deal with the traditional cheesecake problems that come with making them. Now I wish I had more crummy strawberries to make more strawberry mush for the rest of the cake! The best part of a no bake cake? No eggs means I can lick the bowl! This entry was posted in Cake, cheese, Dessert, Fruit and tagged Cheesecake, fairy tales, No bake. Bookmark the permalink. yessssssss! 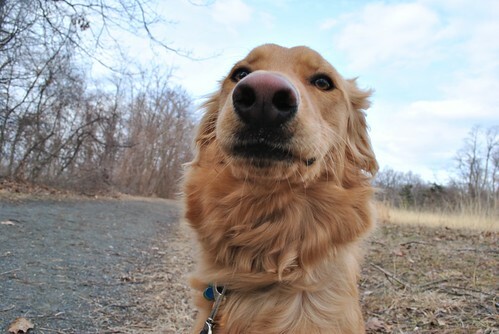 First off, I think you’re pretty awesome. Secondly, you have a dog. 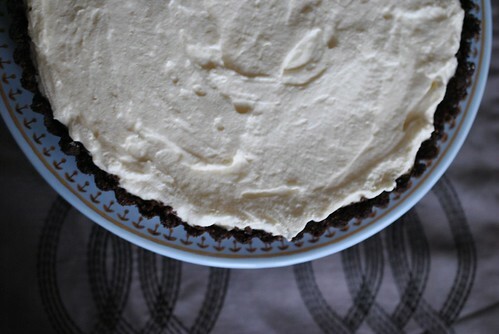 Third – chocolate graham cracker crust, I must experience that. Fourth – this sounds so good. Unfortunately, my stand mixer is in the shop. (weird, huh). Stoked to try this recipe at some point though!